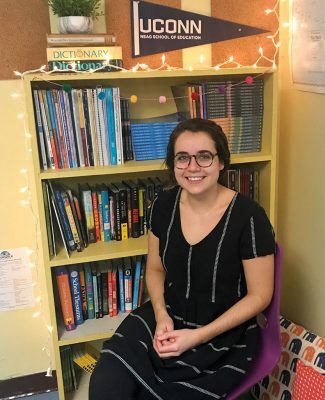 $5K Rogers Award Goes to Neag School Alumna Teaching in Norwalk, Conn.
Alumna Jessica Stargardter ’16 (ED), ’17 MA has been named by the Neag School of Education as the recipient of the 2019 Rogers Educational Innovation Fund award. Stargardter serves as a gifted and talented educator for Norwalk (Conn.) Public Schools. The Rogers Educational Innovation Fund, designated by Neag School of Education Professor Emeritus Vincent Rogers and his late wife, Chris, a lifelong teacher, provides a $5,000 award available annually in support of innovative projects carried out by Connecticut teachers at the elementary or middle-school levels. This gift is intended to support and expand the innovative, collaborative work of Connecticut’s classroom teachers and the Neag School of Education. This is the second year the award will be bestowed. Stargardter will receive $5,000 in support of her project, titled “An Eye for Change: Real World Investigations through Photojournalism.” The project funding will make available to Stargardter’s students a variety of texts and technologies, including disposable film cameras that will allow them to document problems and proposed solutions in their communities, says Stargardter. Stargardter will be formally recognized at the 2019 Neag School Alumni Awards Celebration, taking place on the UConn Storrs campus in March. Read more about the Rogers Educational Innovation Fund at rogersfund.uconn.edu. Private Philanthropy in Public Schools: Can Ray Dalio Make His Gift Work in Connecticut?